There was an immense traffic jam outside the Garde Républicaine army barracks for the debut of Kim Jones at Dior Homme on Saturday evening. And, then there was designer gridlock inside. Karl Lagerfeld sat in a huddle beside Bernard Arnault, the chairman of LVMH and the owner of Dior, while dotted throughout the front row one spotted other LVMH creative directors – Virgil Abloh (Jones’ successor at Louis Vuitton) and Kris Van Assche (Jones’ predecessor at Dior Homme) – along with Kenzo Takada, Stefano Pilati, Chitose Abe, Giles Deacon and, in a sporting gesture, Haider Ackermann. Who was dismissed as designer of yet another LVMH house, Berluti, this spring. Arnault has a reputation of wanting his designers to stage big shows at his biggest fashion houses, and Jones did not disappoint. Kim had show producer Villa Eugénie build a massive arena in scaffolding – worthy of a gladiatorial battle – and covered it in an immense Chinese umbrella. In its center a truly wonderful 12-meter-high statute by the artist Kaws of his signature character BFF. Underneath, a raft of celebrities – Kate Moss, Naomi Campbell, Christina Ricci, Luca Guadagnino, Lenny Kravitz, Victoria Beckham, Kelly Osbourne and Jade Jagger. There was a seat marked for Rei Kawakubo but in the end only her husband Adrian Joffe showed up. In its paws the giant black and pink BFF clutched a one-meter ceramic puppy named Bobby, after Monsieur Dior’s own beloved dog, which was used as a scent flacon. It was the first of multiple references to the founder in an accomplished though not quite brilliant collection. The program notes featured a busy bee favored by Christian and even a quote from Monsieur. “Et quand on prend la nature pour référence, on ne peut pas vraiment se tromper.” Meaning when one takes nature as a reference, one never goes wrong. Flowers appeared throughout the show – most notably in a rapid-fire finale of floral embroideries with Lemarié feathers overlaid with plastic. All highly photogenic. That said, Jones' tailoring has rarely been better – and it was good to see him brave enough to attempt a brand new jacket, in a house legendary for its tailleurs. Kim’s idea: a double-breasted version named the Oblique, worn open but held by a cross strap. While his opening vertical striped jacket and wrap around suits were pretty perfect. According to the program notes, a reference to Dior’s 1950 autumn-winter collection, though to other eyes they recalled a mid-sixties Carnaby Street cut. Jones also sent out Dior’s signature toile de Jouy, picked from a version made for Monsieur’s original boutique at 30 avenue Montaigne, still today the house’s headquarters. He deftly used these in insouciant jacquards and embroideries, even done on a soft leather for a sensitive second skin. 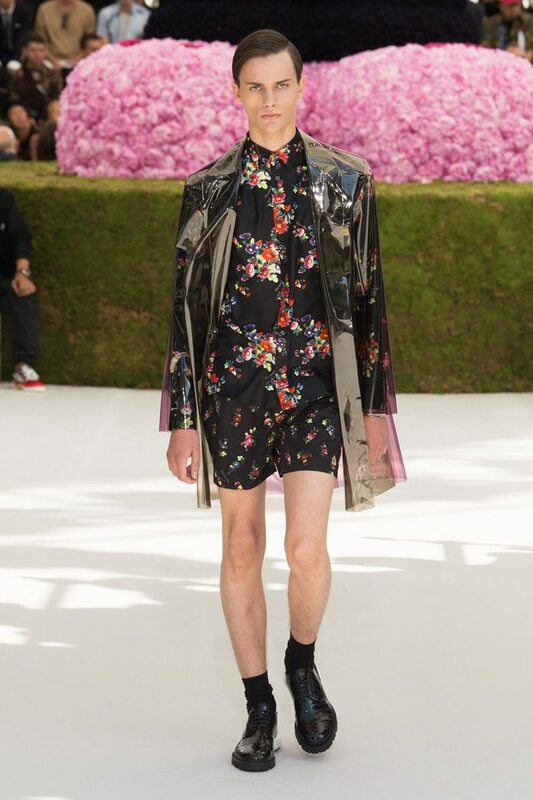 This was a sensitive Dior man, one who wears largely transparent lace shirts with tennis shorts; see-through organza pants; or toile de Jouy tanks. Though this charming new sensitivity was perhaps muffled by the truly deafening soundtrack, kicking off with Born Slippy by Underworld, quite frankly, a track we must have heard on a score of catwalks over the years. The UK designer teamed up with a number of other cool creative types for the show – notably Yoon of Ambush, who provided new metallic jewelry seen in CD flowers and insects. Yoon was the first to greet him post-show – posing before another floral backdrop by the artist Kaws. Followed by a squadron of fellow Britons, who showered him in praise. Though one should recall, there is no more loyal media than the British fashion pack supporting a UK designer in Paris. That’s been true since Englishman Charles Frederick Worth staged the first couture shows in Paris a century and half ago. 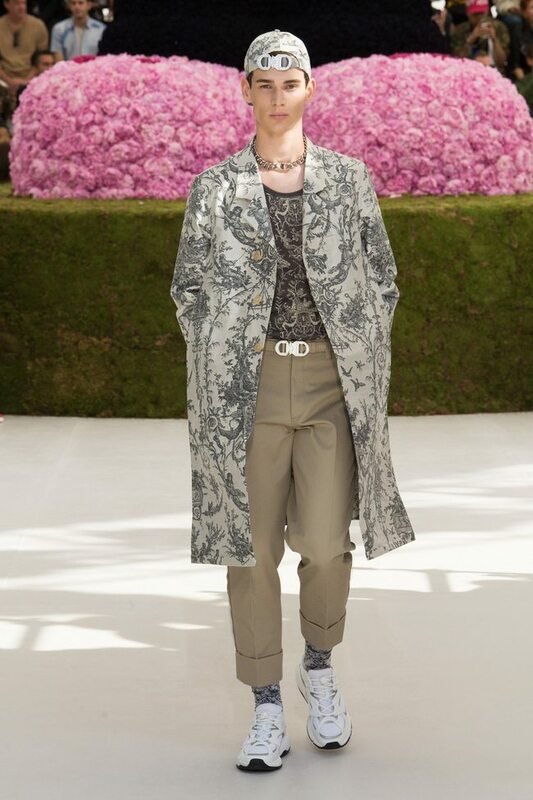 Jones has clearly been working very hard on this collection, and impressed with the first Dior Saddle bags for men, and with the sense of real research into his new house. This certainly felt like an elegant new departure for the house, even if for a first time at bat, perhaps not a home run.